Noë & Associates rebranded and redesigned the Watch Journal. 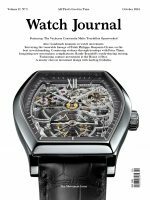 Throughout the magazine’s 17-year history, Watch Journal has been the authoritative voice on horology and luxury watches. The October 2014 issue saw the manifestation of the rebrand and redesign of the magazine and a new approach to the editorial content providing a more refined visual lens to the publication. Mark Noë, creative director of Noë & Associates and an avid watch collector first partnered with Watch Journal’s owner, Marc Lotenberg in early 2013 to create a new iteration of Surface Magazine and partnered again to create a new visual direction for Watch Journal. Mark continues to provide consulting creative direction for the magazine. Scope: Identity; Guidelines; Magazine Design; Art Direction. The magazine provides a refined lens on the watch world. 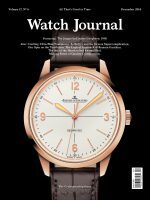 Each issue includes coverage of relevant news and events; the publisher’s recurring column on the business of watches; a behind-the-scenes look at what goes into watch manufacturing; a section of original watch photography; profiles of industry leaders and collector interviews; and a curated special section filled with luxury lifestyle products and services.